Lars Sullivan hasn’t been seen on WWE television for quite some time. He sufferedwhat is believed to have been an anxiety attack before debuting on RAW where he was supposed to jump start a WrestleMania program with John Cena. Since going back home to Colorado, Sullivan has been in a good place. He sought out professional help and could be getting ready for his actual debut on the main roster. With WrestleMania coming up, it makes things even more interesting. It has been speculated that Sullivan could be making an appearance very soon based on how coy Triple H was when the subject was recently brought up during a teleconference. Now The Freak himself is hinting at what he could be doing at the show of shows. I am so multi-talented, charismatic, unique – unlike any superstar past or present and beyond that @WWE often doesn’t know what to do with me.. but at Wrestlemania – they get it right – an uninterrupted full performance is almost all I’ve ever wanted.. 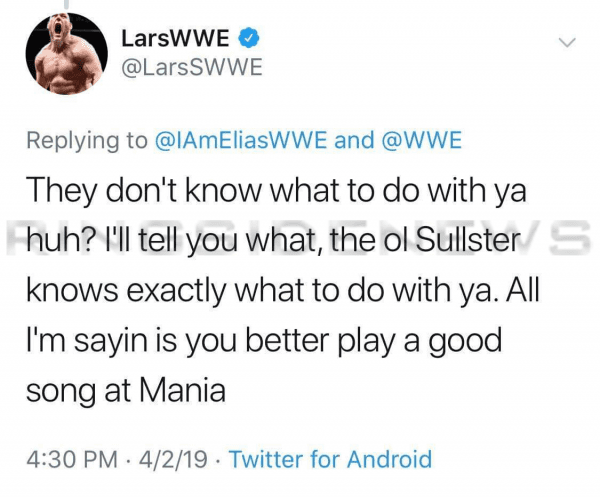 This is a pretty blatant tease that we will see Lars Sullivan at WrestleMania. John Cena is the current front runner to come out and stop Elias’ concert, but you never know if WWE could have a big surprise in store for fans at the show of shows that will see Lars Sullivan made a big impression with his main roster debut.